I am the mother of sons. They are beautiful charmers that of course, hold my heart right in the palms of their gloved hands. Lacrosse-gloved hands that is. You see, my sons play lacrosse. Maybe I should clarify that. They live, eat and breathe lacrosse. It is their year – round sport, their passion, and where they learn many a life lesson…right there on that hard green turf. A few years ago, one of my sons went through a crisis. A perfectionist by nature, he began obsessing over every missed opportunity, any dropped ball, every wrong move….to the point that he began to mentally freeze if he made a mistake. My son was going through some life changes as well…Even so; this camp was both a hard time for him, and time of reflection and personal growth. He shared his issue with his coaches. We talked it through. He discussed it with his Dad. We prayed over it. I prayed some more. His confidence was sinking. It was affecting more than one area of his life too. As parents, we keenly felt his frustration but we knew he had to own it. It wasn’t skill that was the issue, it was perspective. It was about this time a friend invited him to attend a lacrosse camp. The Fellowship of Christian Athletes camps focus on the mind, heart, and character of the young men and women who attend… they also play lots of lacrosse (for three days)! During this time, my son was experiencing some life changes as well. He was in a perfect storm of adversities unrelated to lacrosse. Attending this camp was a necessary but hard time for him. Going helped him get back on track; it changed his point of view…he began to widen his perspective and let God back into the picture. Where he had always been focused on his control of the issues, he began to learn who really was in control. Him? Not so much. That was the beginning of a young man’s discovery of his own heart and mind, his faith and yes, of his sport as well. So, with his permission and input, he has allowed me to share what he (and we) have learned and are still learning. 1. Who do you play for? The question cuts right to the heart of every human being. We spend our whole lives pushing to accomplish…there is nothing wrong with that. It just depends on who’s strength we are working from and whose glory we are seeking? If the answer is “mine”, then we will be on the path of exhaustion, spiritual weakness and come to really understand what Jesus meant when he said in John 15:5-9, “apart from me you can do nothing.” It might be better to heed God’s warning, and attempt to do all things for His glory, not our own. 2. Don’t start a race you don’t intend to finish…strong. This refers to athletics, yes, but we need to understand that our real purpose on this earth is to make a lasting difference for Christ. To run the race well is to yield to God’s purpose and calling on our life and strive to finish well. We are all given gifts to use to help others. Mother Teresa said it like this, “I’m like a little pencil in His hand. … The pencil has only to be allowed to be used.” Let the prize we seek not be from earthly accolades but for fulfillment of God’s purposes in us, whether they be big or small. 3. 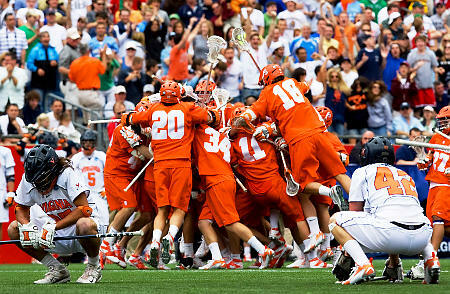 Lacrosse is a team sport. Like the celebration picture at the top of this story, success comes only when team mates trust one another, play selflessly and work together for the common goal. The team cannot thrive with prima Dona’s in its midst. This behavior undermines a lacrosse team, surely. More importantly, it causes heavy damage to the body of Christ. If you mess up, then acknowledge it, do what you can to resolve it and correct it the next time, and the next time… on the field, this means picking up the dropped ball, making a more consistent pass, shooting more directly next time. Work toward what you can change and let the mistakes of the past go. This may have been the toughest lesson for my son to learn, as he consistently saw his own short comings on the field and rarely realized others around him were making the same mistakes. For those who are followers of Jesus Christ, this means to remember God is a God of second chances. If God gives us grace, surely we can give it to ourselves (and others too). We are called to repent (turn away) from our sins. That means own our mistakes, confess them with our mouths and believe in our hearts that we can be forgiven through the mercy of God. Not because we earn or deserve it, because heaven REALLY knows we don’t, but because “all have sinned and fall short of the glory of God, and are justified freely by his grace through the redemption that came by Christ Jesus.”– Romans 3:23-24. So when my son drops the ball, he will just pick it up, address the issue and do it right the next time. And when any of us makes (yet another) life mistake, handle it the way God asks us to. Take responsibility, ask for forgiveness and through God’s redemptive power (not our own strength), let it go and be healed…and try not to “drop” that ball again. But if you do, God Our Father will be there… for the next time too. “…he does not treat us as our sins deserve or repay us according to our iniquities. For as high as the heavens are above the earth, so great is his love for those who fear him; as far as the east is from the west, so far has he removed our transgressions from us”. Family Lessons, Life lessons, Life Stories, Living For God, Parenting God's Way, Teenagers, What Is Truth?